A magnitude 7.2 earthquake shook large parts of the Visayas and Mindanao on Tuesday, October 15, bringing widespread damage in the region. I was young, I wanted to visit these historical churches especially those centuries old churches. Other than being our religious establishments, these are also historical landmarks, and we're studying it since elementary to high school until college, and in a matter of seconds, they're ruined. I haven't been in Cebu or in Bohol or any part of Visayas and Mindanao, but when I saw pictures made by the magnitude 7.2 earthquake in Cebu and Bohol, I feel like I'm devastated - I was shocked! It's heartbreaking, indeed. 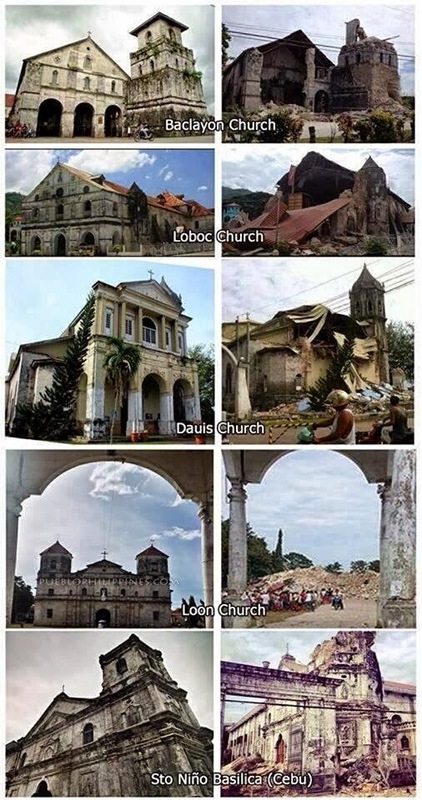 These are a loss not only to the Visayans and to those in Mindanao but to all Filipinos in general, because other than them being religious icons for the Catholics, for everyone else, they're heritage sites that clearly reveal a portion of the history of these islands and the people. If only we had enough funds that would have helped protect these landmarks - to bring it back. I hope the damaged sites are rebuilt soon too since this is part of the region's tourist industry and it would help them get back on their feet. it was very sad indeed..